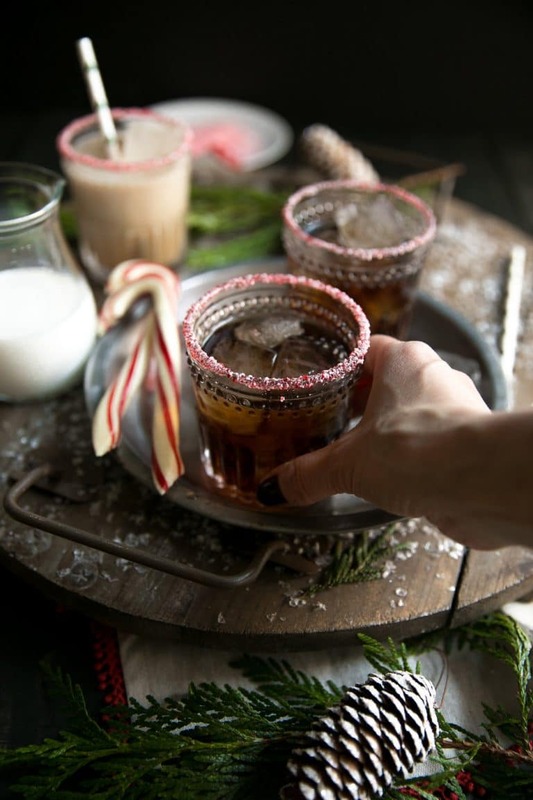 Get festive this holiday season with this super easy Holiday Peppermint White Russian. 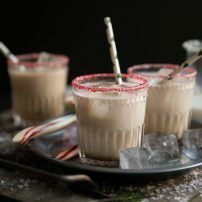 Made with Kahlúa, Peppermint Schnapps and, of course, Vodka, this delicious cocktail will have everyone singing. If I could get away with lining every single one of my cocktails with some kind of salt or sugar rim, I totally would. 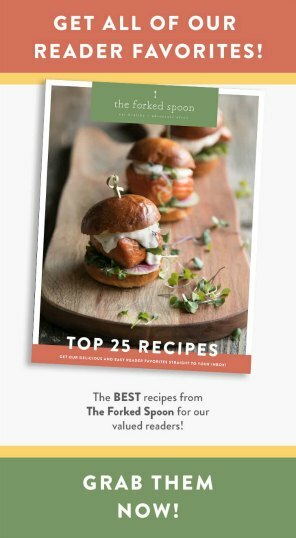 Ever since doing it for this margarita recipe, I literally want to coat all my glasses with some form of sugar decoration. 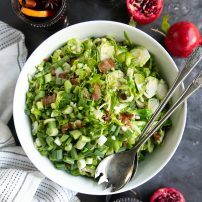 Buuuut, I’m not here to talk about cocktail salts (although you should totally make this candy cane one). 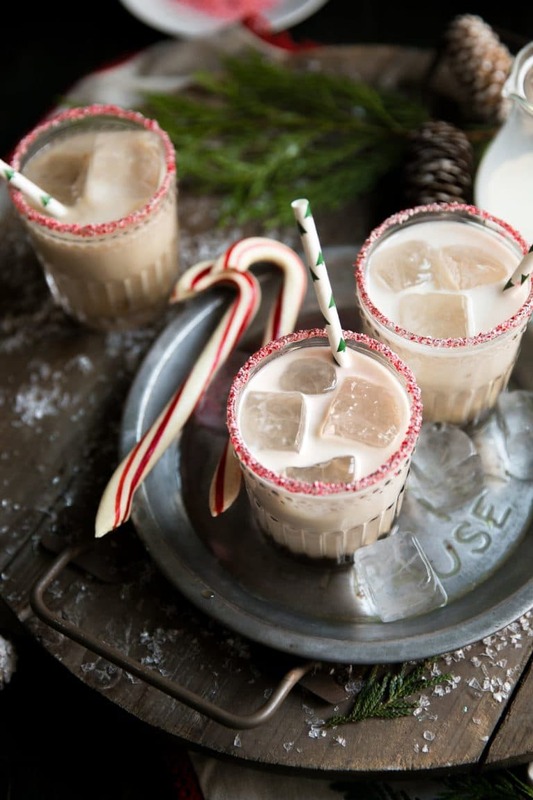 Today I’m here to talk about this delicious Holiday Peppermint White Russian…and probably a whole lot of other nonsense (it’s one of those kinds of days). Traditionally, White Russians are made with Kahlúa, Vodka and a splash of cream and served in an Old Fashioned Glass. Contrary to the name, the White Russian (or Black Russian- a White Russian minus the cream) did not originate in Russia. 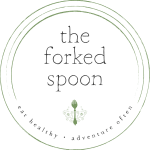 They were simply given the name due to the vodka. At least that’s what Wikipedia told me. Anywho, these cocktails are seriously delicious. 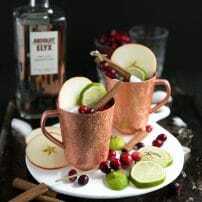 Add a little Peppermint Schnapps and HELLO, Christmas! Stick a candy cane in there and BOOM! Party time! These festive and fantastic holiday drinks take less than 5 minutes to prepare, so I highly recommend sipping them all winter long. My sister is currently in LABOR! yay! 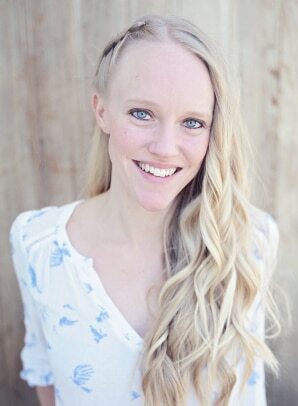 I am soon to be an auntie for the very first time and I could pee my pants from excitement. There may be some photos coming your way soon. Sorry, not sorry. My 4-year-old asked me if I was 54 the other day. He later redeemed himself by saying I didn’t look old. My 4-year-old is also super into my make-up and often says, “I wish I were a girl so I could wear makeup”. I find this hilarious since my makeup consists of a concealer stick and mascara. If only he knew about eyeshadow! I made the mistake of putting a bag of chocolate chips on my desk and now they’re definitely not on my desk anymore. I just finished watching every season (except for the last) of Real Housewives of Orange County and I am experiencing serious withdraws. You guys, that was the best background noise and cooking company ever!! So much pointless nonsense. It was amazing. 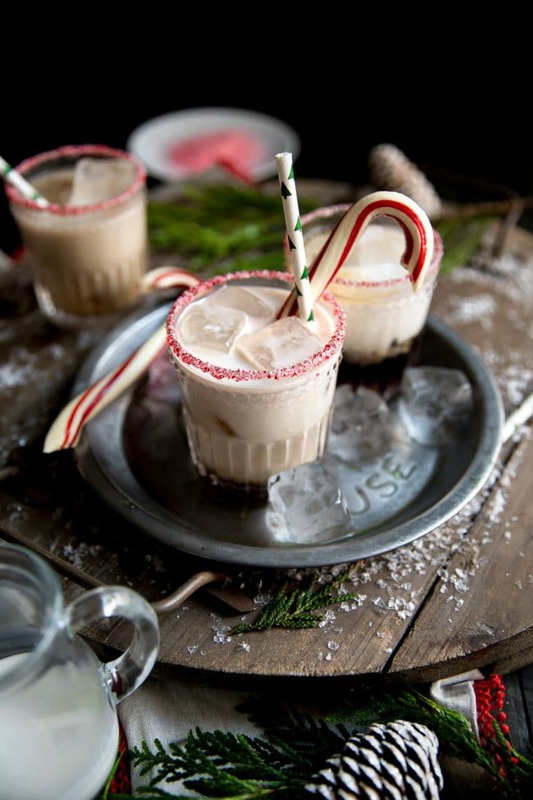 If you try this Holiday Peppermint White Russian, please leave me a comment and let me know! I always love to hear your thoughts. 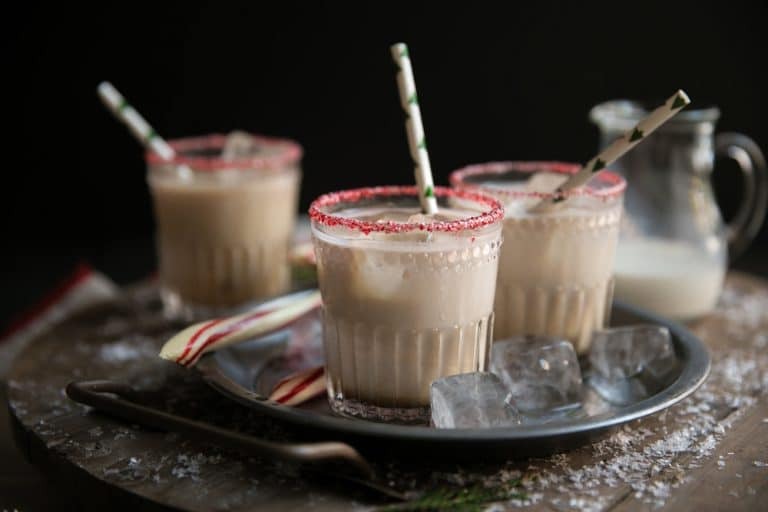 DON’T FORGET TO PIN AND SHARE THIS FESTIVE AND FUN HOLIDAY PEPPERMINT WHITE RUSSIAN RECIPE TO SHARE WITH FRIENDS AND FAMILY THIS HOLIDAY SEASON. 3 oz milk - or half and half. Pour to desired amount. Combine crushed candy canes and granulated sugar in a small bowl and mix well to combine. 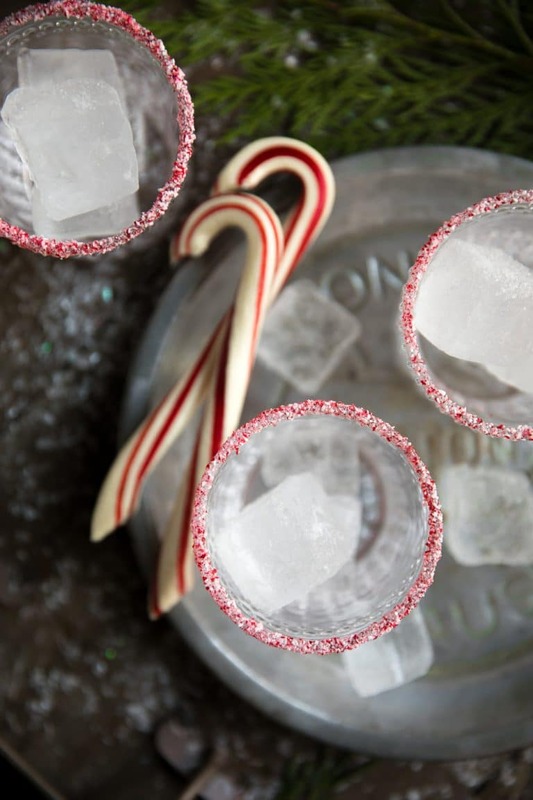 If desired, rim the top of each glass with candy cane and sugar mixture and fill with ice. 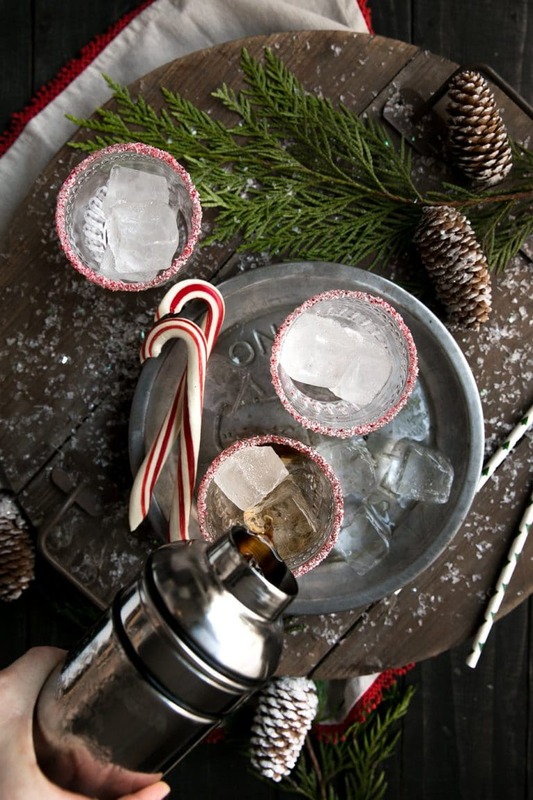 Fill a cocktail shaker with Peppermint Schnapps, Kahlúa, vodka and ice. Shake well until combined and cold. Pour into prepared glass and top with desired amount of half-and-half or whole milk. 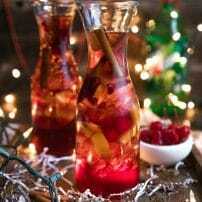 Garnish with additional candy canes, if desired.